Due to problems beyond my control we will be disabling the attachment option for posting pictures like image shack or photobucket. We have gone beyond our storage capacity. Here is a link to our picture posting tutorial. Any questions contact any admin. Swede, what is your hosting limit size for the site (not the backup limit, but the full storage size based on your hosting plan?). We have no limit on storage space. Its hostgator that puts a limit on how much space we take up in their system for back ups. Its their fault they dont have the capacity to back up their clients. Hostgator has different levels of service (At increasing prices) The lowest tier is the least expensive with the lowest limits and the least number of features. They have larger backup options at the higher tiered pricing and service levels. However, it's never a good idea to trust backups to one location (Particularly if they are on the same server the main data is). According to this info from hostgator, it might be time to give them a hollar and see what they offer for other tiers. Special note in that info from host gator: Note:[/size] You may only create backups via cPanel of 4 GB or less. If your backup is larger than 4 GB or over 100,000 inodes, you must contact HostGator support for help to bypass the limit. [/size]Has anyone contacted them yet about what is involved in bypassing this limit? It may be a cost upgrade or it may be a redirect to a 32 bit storage platform. There may be other solutions available from host gator before having to look at external backup options. They do offer backup for larger SEO's and other groups. With any luck it's free or relatively cheap. (It was a $3.49 a month upgrade on my last host to have full site backups daily up to 40 gigs). Ive talked to their tech support about this but didnt ask about a different tier. Ill give them a call. No problem. I have a photo bucket account. How is Image Shack? Photobucket is just frustrating. I see a few of my recent posts had the pictures removed, so I put them back using the Image Shack link. 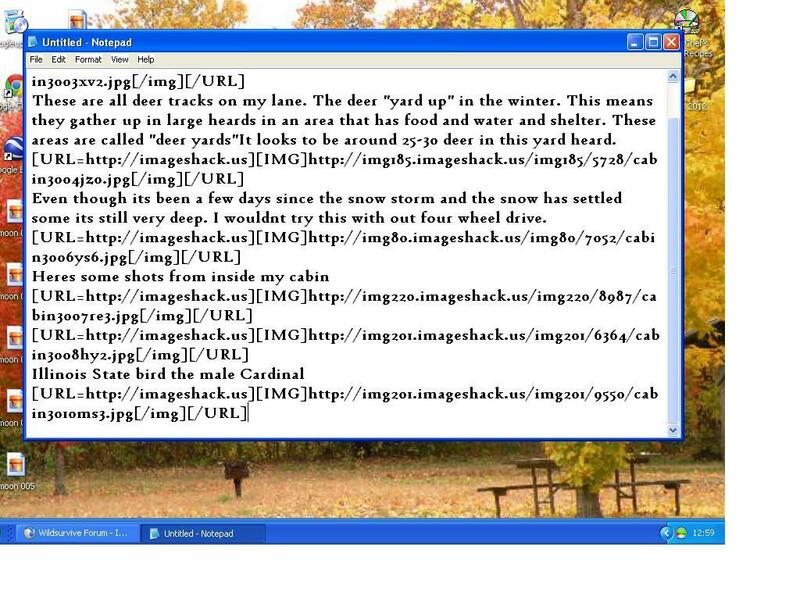 Here is what I do when using image shack. I copy paste the links on windows note pad. Ill start with a comment about the picture. Some times a double enter between picture links looks better between pictures.